"Domus Pacis" is a house of prayer, bought in 1990, where prayer seminars (especially "Prayer and Fasting Seminars"), retreats and recollection days for local and foreign pilgrims take place. Mother's Village is an establishment for the education and care of abandoned and neglected children. It has existed since 1993. It emerged from the desire of its founder, Fr. Slavko Barbaric, to offer children and youth a planned, organised education, as well as care, so that they can develop physically, intellectually, morally, spiritually and culturally. Through Catholic contents and ideas, the collaborators offer them a condition of freedom, dignity, acceptance, and above all, love and understanding. The care of children was entrusted to the Franciscan School Sisters from Herzegovina, and to lay staff members. The establishment started its work officially on September 8, 1996. A Kindergarten, a Dentist's Lab and a Physical Therapy Station are also on the Mother's Village Campus. Through patient work and care, a neglected pine forest grown on rocky ground became a beautiful natural place for recollection and recreation, prayer and education. There are also two little artificial lakes, didactical material for work with children, several domestic and wild animals and birds, as well as three ponies, which serve for hypotherapy (therapeutical riding adapted for handicapped children). The presbytery, built in 1892, immediately after the creation of the parish, was restored in 1990. At the time when the old parish church was still under construction, when it was unsuitable for use, as well as during the war in 1992, Holy Mass was celebrated in its cellar. The door of the presbytery is always open not only for the parishioners, but also for the pilgrims of the whole world. In the presbytery, in the room where he was killed by the communists, you can find the relief of Fr. Križan Galic. The Information Booth was created in 1991 and was re-established after the war in 1995. 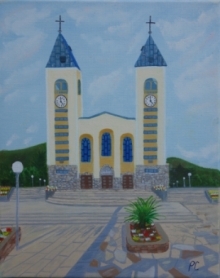 It serves the organisation of the pilgrim's programme at the Shrine: it centralises the registration of pilgrimages, establishes contact with guides and organises meetings with Medjugorje Franciscans and visionaries. The Association of Guides, established for the bettering service to pilgrims, is tightly linked to the Information Booth. The First Aid Station, opened in spring 2003, is on the west side of the Shrine, near the parking. Medical Service of the Maltese Order helps pilgrims and parishioners daily from 9 am to 9 pm, from May 1st to November 1st. The parking lot, where pilgrims can leave their personal vehicles and busses, is on the west side of the Shrine.